Following a successful defense on Thursday, I'm posting as promised the chapters of my dissertation, which focuses particularly though not exclusively on Bahrain. This dissertation challenges the prevailing rentier state interpretation of political life in the countries of the Arab Gulf, a theoretical framework little changed for more than a quarter century. It does so by evaluating for the first time the fundamental claim of rentier theory to understand the individual-level drivers of political views and behavior among ordinary citizens of rent-based regimes, in particular its assumption that individuals are content to forfeit a role in political decision-making in exchange for a tax-free, natural resource-funded welfare state. By this conception, citizens’ degree of economic contentment is the key variable influencing the extent of their political interest and demands for participation; normative support for their governments; and, ultimately, the overall stability of their regimes, with other, non-material factors playing no important systematic role at the individual level. 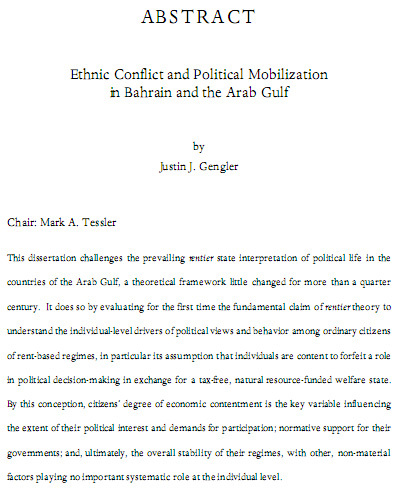 Yet this dissertation identifies and elaborates one important conditionality to the basic rentier premise that economically-satisfied Gulf Arabs make politically-satisfied Gulf Arabs: the existence of societal division along confessional (Sunni-Shi‘i) lines, a condition present in each of Saudi Arabia, Kuwait, and Bahrain. Utilizing the results of over a dozen elite interviews and an original 500-household survey of political attitudes in Bahrain, along with parallel survey data from Iraq, I demonstrate that in societies in which confessional membership is politically salient, this shared identity offers a viable basis for mass political coordination in a type of state thought by its very nature to lack one. Under this condition, I show, the political opinions and actions of ordinary Gulf Arabs are not determined primarily by material considerations but by an individual’s confessionally-defined position as a member of the political in- or out-group. Moreover, I demonstrate, concerns about the national loyalty of the confessionally-defined political out-group—that is to say, about the perceived threat of Iranian-inspired Shi‘a emboldening—means that the latter community is disproportionately excluded from the rentier benefits of citizenship. In sum, in Bahrain and other Gulf societies divided along Sunni-Shi‘i lines, neither is the rentier state willing to offer its presumed material wealth-for-political silence bargain to all citizens, nor are all citizens willing to accept it. For the full (366-page) version, click on the image below. Chapter 2 offers a more expansive account of the conceptual framework introduced already, a theory of ethnic-based political mobilization in the Arab Gulf rentier states. 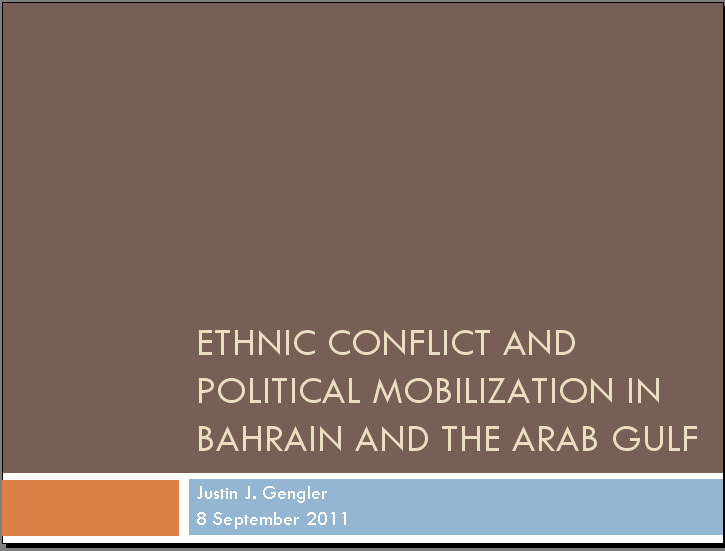 Chapter 3 gives additional substance to this theoretical account by studying the case of Sunni-Shi‘i conflict in Bahrain. Drawing insights from interviews conducted with some dozen Bahraini political and religious leaders—four of whom now face lengthy prison terms for their alleged roles in the February 14 uprising—this section describes how, in Bahrain, the individual-oriented politics of economic competition assumed to operate in allocative societies is superseded by an ethnic-based contest to determine the very character of the nation itself: its history and cultural identity; the bases of citizenship; and the conditions for inclusion in public service. Chapter 4 supplies a practical and methodological preface to the analysis of my Bahrain mass survey, detailing the actual survey procedure, likely theoretical and methodological objections, and a first reliable look at Bahrain’s ethnic demographics since its 1941 census. Chapter 5 employs the previously-unavailable data from my Bahrain mass survey to explore the determinants of political opinion and action among ordinary Bahraini citizens. It seeks to discover whether Bahrainis’ normative attitudes toward their government and the political actions they take for or against it are influenced foremost by material satisfaction, as per the rentier state hypothesis, or by ethnic affiliation and orientations, as argued herein. Chapter 6 mirrors the Bahrain mass survey analysis with a parallel study of political opinion and behavior in Iraq. Using comparable survey data, this investigation aims to learn how far the individual-level relationships uncovered in the previous section are limited only to the Bahrain context or, on the contrary, obtain more widely. Chapter 7 reviews the preceding, makes note of its limitations, and suggests how it might be extended as part of a larger revised Arab Gulf research agenda. Get all this now before I somehow lose the ability to publish it thanks to the dysfunctional copyright regime of the United States. Congratulations Dr Gengler! Thanks for posting. And I hope to continue reading your views about our tiny island. I, too, hope to continue reading your insightful postings. They are held in high regard by myself and many other expats. I thought the conclusions of your original survey upon which this work was based was inherently flawed because although the participants in your survey claimed they have no interest in Islamicising Bahrain, it fails to take into consideration the fact that most of them apparently voted for Islamist candidates who in turn attempted to implement Islamist ideologies. This should have raised alarm bells as to the truthfullness of your result. Therefore, I am not sure how valid the results of this study will be if one of the source materials is so flawed. @Anon: I'm afraid I don't understand your comment. I assume you're referring to my Foreign Affairs article that used some survey results to argue that Bahraini Shi'a (and Sunna) do not support Islamic-based government as a way of ruling Bahrain. In the first place, none of the survey results summarized in the article tie respondents' voting patterns to their political system preferences. You could certainly do this, and examine whether or not support for certain political parties is associated with more support for Islamic-based government, but you wouldn't be able to make this inference based on the statistics presented in the article. Even apart from this, are you suggesting that al-Wifaq, al-Manbar, and al-Asalah are attempting to "implement Islamist ideologies?" Certainly they represent religious-based political societies, but in order to "implement Islamist ideology" as a form of government (the focus of my article) they must be in a position to change the current regime altogether, whereas clearly none of them is. Please clarify if you care to. wow Dr Justin , I have read so far to page 86 of the piece and I am truly amazed by the depth of the work and the effort you put in it ( not to mention how insightful and informative it is) .And as to comment to the section I read so far relating the third chapter , I have always felt that when looking at the roots of the political problem you would find that it is because the face that Bahrain shows to the world (and has shown) is : an kingdom/emirate that is sunni and tribal/bedouin , and the fact that this face may change due to the empowerment of shia in politics in of the greatest fears of the Bahraini ( and indeed other gulf governments) .What shocked me however was how much the information you provided and the historical context fit in this theory . At the first days when the protests started and a fair deal of sunnis was sympathetic to them I felt that for the first time in my life I felt that the true national identity for Bahrain was being born and that this may signal the birth of what the face of Bahrain should be ( and I was dissappointed for many reasons later ). However, it remains that Bahrain will never be able to truly end political turmoil unless true and tangible efforts at revising history and creating a Bahraini identity is reached (regardless of how much the government is against that ). Congratulations, Dr. Gengler. Now that you're done with the dissertation, we're all looking forward to new posts from you. It's impossible to follow events in Bahrain without you. @Ahmad and Elizabeth: Thanks, although it may take some time before regular posts return, as I am currently in limbo living in temporary quarters and getting ready for the move to Doha. But we will see. Congratulations! I look forward with great interest to reading your dissertation, perhaps on my long flight to Bahrain this weekend. 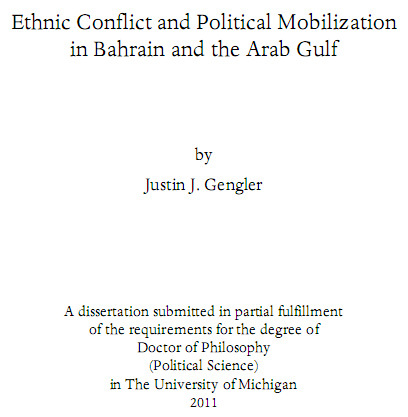 The dissertation in itself looks good, but "Arab Gulf"? What happened to the good old Persian Gulf? @Anon: The reference is not to water. The "Arab Gulf" is a rather common shorthand for "the Arab Gulf States" or "the Arab States of the Persian Gulf." No nomenclatural revolution intended here. Ah I see. However, I find it very confusing. Really up to you how to phrase it, but why didn't you just use something like "The Arab states of the Persian Gulf" or something similar? This particular terminology is a bit confusing. You've obviously put a lot of hard work into this! I admit I have not read it all - just skimmed. However you seem to have ignored at least one important sector of Bahraini society. Unlike some other Gulf countries Bahrain has a large merchant / professional class who, while perhaps not as politically active as they could be, play a key role in banking, business etc. Many of the leading merchant families are originally Iranian Sunnis who left Iran in the 19th and early 20th centuries. While they are possibly under represented amongst MPs etc, they are nevertheless a very influential segment of Bahraini society. @Final Anon: thanks for the comment/suggestion. You're right that the explicit focus is on the Arab Shi'a of Bahrain (and in Ch. 6 Iraq) and does not include systematic treatment of the Hawala (in fact, there is a footnote to this effect). This is due to the focus of the dissertation, which is interested not primarily in the intricacies of the case of Bahrain per se but in what Bahrain represents more broadly, namely a rent-based society in which ordinary citizens are not pacified politically strictly on the basis of economic well-being. Yes. I take your point. And the Bahrain case is very full of intricacies. But we are a little bit more than just a rent-based society. Quite a sizable professional middle class.